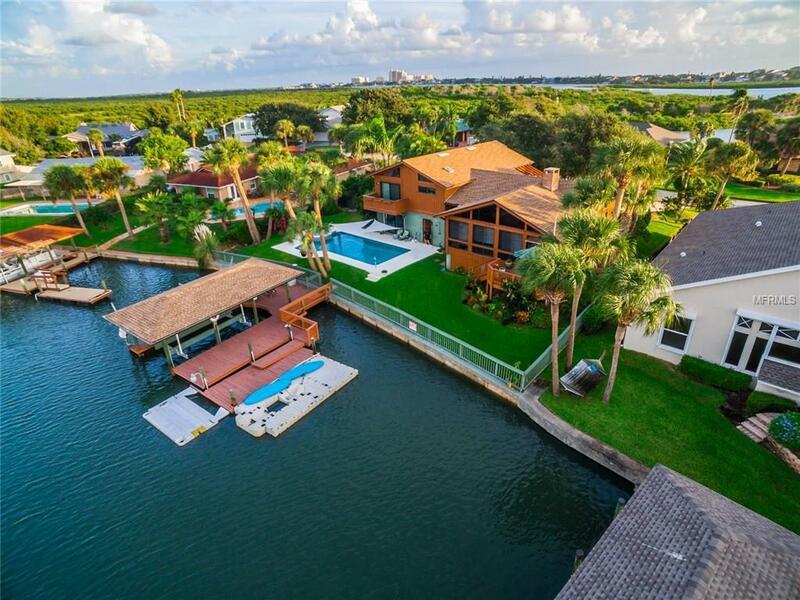 One or more photo(s) has been virtually staged.DEEP-WATER INTRACOASTAL ACCESS, beautiful grounds, high elevation and an opportunity for customization await in this UNIQUE CUSTOM HOME. 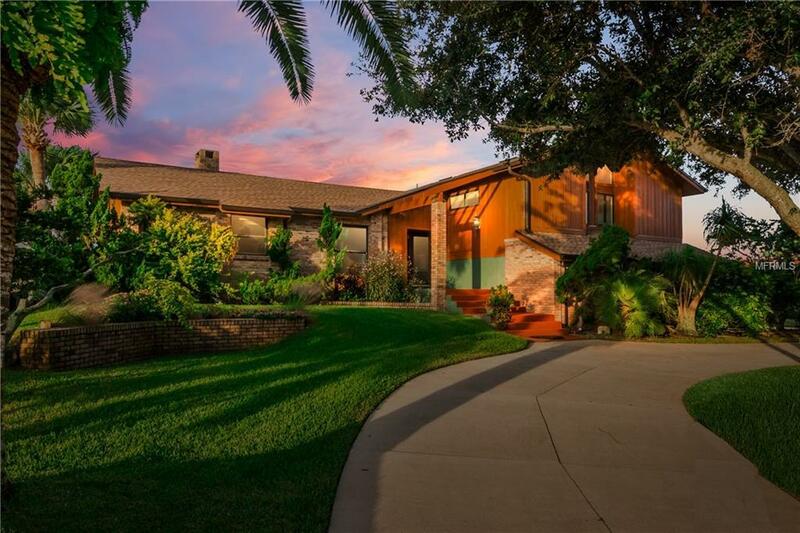 Except for the PARTIALLY-RENOVATED Master Bathroom, the home has been thoughtfully updated throughout! The other 2 full baths have TRAVERTINE TILE, GRANITE and all NEW FIXTURES. The CIRCULAR DRIVEWAY welcomes you to step atop the ELEVATED FRONT ENTRY where unobtrusive security cameras alert the hosts of your arrival. 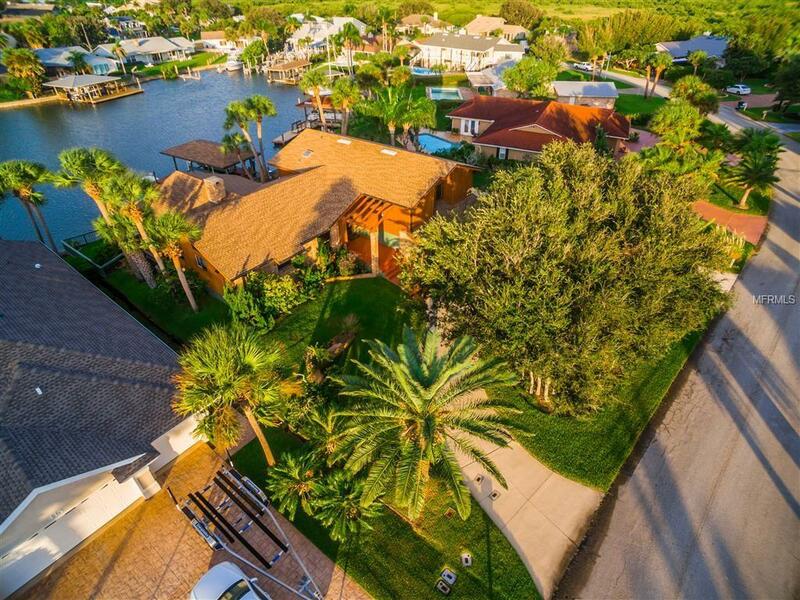 Once inside you are greeted by HIGH CEILINGS with WOOD BEAMS, Saltillo Tile flooring & big views of the wide canal, DOCK and COVERED BOATHOUSE. The open living room and dining room share a DOUBLE-SIDED, WOOD-BURNING FIREPLACE alongside the MODERN KITCHEN. Take your morning coffee with a little dolphin watching from the Elevated Deck, right off the Florida Room. After relaxing in the SALT WATER POOL & SPA escape to the privacy of the Master Suite to enjoy sunset views from the BALCONY! The home has IMPACT WINDOWS, TWO HVAC SYSTEMS and custom FABRIC SCREENS. Other features include a NEW ROOF in 2018, OUTSIDE SHOWER, TIMED LANDSCAPE LIGHTING, MOTION DETECTION LIGHTS, and SECURITY CAMERAS at all entry points including the Dock. 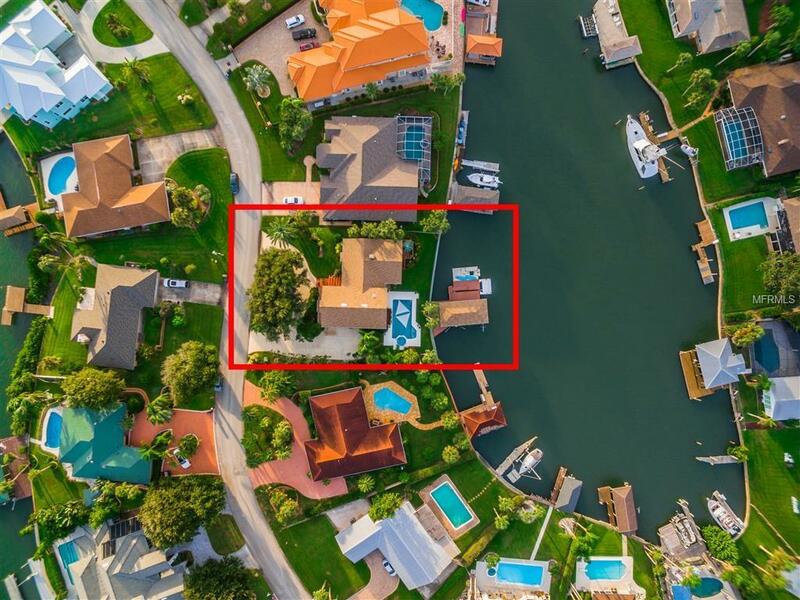 The 36 X 13 BOATHOUSE & 15,000 BOAT LIFT are equipped with water, electric, NEW LIFT MOTOR, 3 DAVITS, DOCK, 2 FLOATING DOCKS for personal watercraft and lots of room for outdoor entertaining all along 100 FEET OF WATER FRONTAGE! The OVERSIZED GARAGE is finished with Vinyl Flooring and Finished Cabinetry in the air-conditioned space. Amenities Additional Fees There Are Tennis Courts Available To Owners in The Neighborhood Of Venezia. They Are Maintained Not By An Association But By A Neighbor. The Cost To Use The Courts is $25 Per Year.